I received the greatest preparation for the current issues facing community college leaders in my exposure to world-class professors at NC State who allowed me, as a graduate student, to explore real-world issues in the classroom setting. The experience of practicing problem identification and problem solving continues to assist me in addressing issues that now face our college. When I arrived at NC State I truly believed that my knowledge base regarding community and technical colleges was adequate, however, in a very short period of time I realized that the complexity and variety of these colleges far exceeded my world view. By delving into the intricacies, I came away with a clearer understanding of our unique institutions. The professors, theoretical frameworks, classroom and experiential learning that I received at NC State contributed greatly to my success as a community college president. My experience as a student and graduate of NC State’s College of Education is utilized everyday as a community college president, whether it is the use of techniques to engage the many constituents of the college or using data to make informed decisions. I often refer back to the theories and concepts that were taught by professors and the experiences from my internship as a graduate student to help guide our institution. The education I received at NC State continuously forms the basis for effective leadership at James Sprunt Community College and I would dare say at many other 2-year institutions across the Nation. I would advise students who are currently enrolled in or considering the College of Education to strongly consider a career as a community college leader due to the need for a new generation of competent and courageous CEOs to lead our 2-year institutions into a new phase of development. I would also advise the students to gain as much knowledge and experience as possible from their professors while enrolled in the College of Education. Prior to assuming the presidency at James Sprunt, Dr. 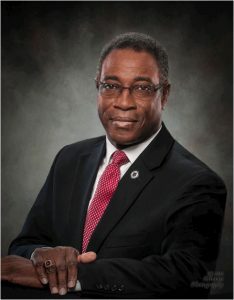 Rouse served as the Dean of Student Services at Johnston Community College and Associate Vice President for Enrollment Management and Dean of Student Affairs at Central Carolina Technical College. He has over thirty three years in higher education experience and leadership in community colleges. Dr. Rouse’s recent professional activity includes establishing the Viticulture and Enology Curriculum, the Department of Corrections Training program for his region, the Carolina East Incubator Kitchen and the Pre-K to College Initiative. Among numerous professional awards and citations, Dr. Rouse was presented the Educator of the Year (Duplin Rotary Club), the I Have a Dream Award (MLK Commemoration Committee), and the Torch of Wisdom Award (Delta Sigma Theta Sorority). After receiving his masters degree from the University of South Carolina at Columbia, Dr. Rouse was selected as one of four South Carolinians to receive a Kellogg ACCLAIM Fellowship to attend North Carolina State University. As a graduate student, he also received a National Leadership and Institutional Effectiveness Fellowship.